In several Canadian provinces, Family Day is a statutory holiday occurring on a Monday in February. Two-thirds of Canadians live in a province that observes this holiday. Except in British Columbia, Family Day coincides with Presidents’ Day in the United States. In the City of Leduc, one dynamic group has been celebrating Family Day for several years now in a big way, and their efforts must be recognized and applauded. Boasting regular visitors from all over the region, Gateway Family Church in the City of Leduc prepared for this Family Day Monday event with a large committee of nearly eighty enthusiastic volunteers. Six of them were seated at a long table in the main foyer cheerfully greeting visitors and encouraging them to sign ballots for a door prize, while offering an event floor plan and colorful church brochure that highlighted the church’s many activities and programs geared at men, ladies, kids and teens, led by Pastor Landen Dorsch and a team of ministry directors and associate pastors. A young Wetaskiwin resident Savannah Hilgartner, visited the Thistle Hill Petting Zoo set up in the church’s lower level gym with her fiancé and their two kids. Her 3-year old, “enjoyed the face painting, the bounce castle and the animals!” she shared, while holding cute Elias Saddleback, her seven-month-old boy who was visibly fascinated with the pigmy goats, rabbits and miniature horse all around them in the enclosure. A long-legged African zebu female, nearly full grown at 3.5 feet, was quietly roaming the confined space and seemed to enjoy the petting. The petting zoo was definitely a favorite venue, but there were many more activities that pleased the crowd. The Mojo Photo Booth set up in the spacious dining area (aka the Youth Room) where free hotdogs and refreshments were served, the fishing pond and ‘Pick a Duck’ game, the Cookie Corner and the Bowling Alley, the obstacle course and the fabulous Magic Show (delivered twice) were all much appreciated. The artist who mesmerized both kids and adults with skilled illusions and unique humor was Braden Pole of Calgary. Arriving from Edmonton with their parents, twins Jonathan and Nicholas Wilkins were happy to hang out with their loving grandma, long-time Leduc resident Manon Wilkins and to get their face painted with colorful monster masks. June Bug Entertainment’s team of six artists was on hand to fulfill the artsy requests of young and old visitors. Cindy Ohlmann is the founder of this 8-year-old venture; among her helpers were her sister- in-law Julie and Pipestone Flyer admin team member Tammy and her daughter Mercedez, who have been face painting for five years and seem to have a true talent for it. A prayer booth was set up in a hallway, where guests could present their prayer request to the two young ladies who then would either pray on the spot, or reserve their prayer for later. This reporter recorded their sweet prayers for Christof, a beloved son-in-law soon going for a liver biopsy. The volunteers were cheerful and well-organized in this fun and memorable Family Day event. Gateway Family Church and its large following of volunteers and annual guests must be commended. Mark the date and location for next year. 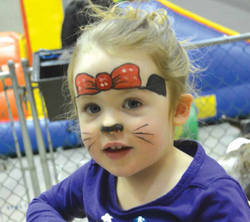 Pictured: Cuteness came in many forms at Gateway Family Church’s Family Day Event in Leduc. Photo by Dominique Vrolyk. See more event photos in this week’s paper.